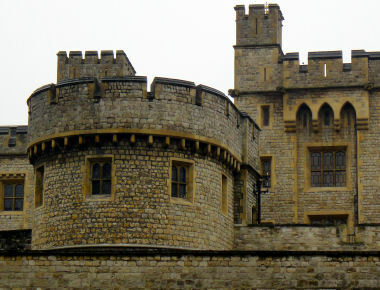 The original Bowyer Tower was part of Henry III’s curtain wall around the Tower of London. The tower, which was built in 1238-41, is located midway on the north face of the fortress. Following a fire in 1841 the upper of the two storeys was rebuilt in the following year. The exterior of this upper storey is built of ragstone coursed rubble, with large dressed limestone square-headed windows and pointed arched doorways. The parapet is corbelled and crenellated, as are the chimney stacks. A string course runs around the middle of the ‘D’ curve in the Outer Ward, dividing the upper and lower storeys, and connecting with the string course on the north side of the inner curtain wall. A steep stone batter forms a plinth around the base of the Bowyer Tower and the curtain wall on the outer ward side. The south façade of the Bowyer Tower is of the same materials, but is flat with no battering, and faces out into the Inner Ward. 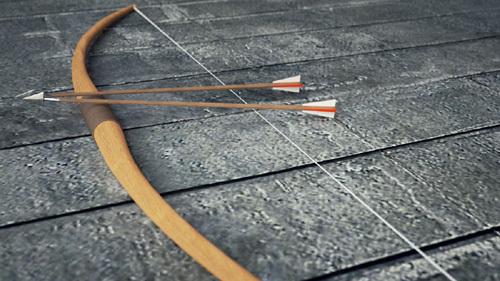 There were originally three arrow loops in the tower only one of which survives to the present day. A stone spiral staircase leads from the Inner Ward within the tower, up to wall walk level. The Bowyer Tower derives its name from the royal bowmakers who once worked there. This part of the Inner Ward was where ordnance – that is weaponry and military supplies – was stored and administered. In 1545-7, Henry VIII had an enormous series of ordnance storehouses built there against the inner curtain wall. These survived until their demolition and replacement with the Grand Storehouse, which was completed in 1692. The Grand Storehouse was a resplendent piece of classically inspired architecture, built of brick with Portland stone dressings. Its ‘Small Armoury’ was installed on the first floor, and included tremendous displays of thousands of small arms arranged in imaginative tableaux. On the 30th October 1841 the Grand Storehouse, the Flint Upper Bowyer, and Brick Towers, together with portions of the northern inner curtain wall, were burned down. 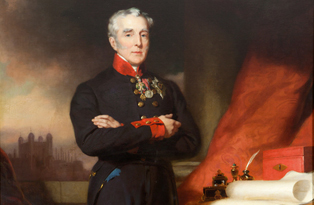 The disaster coincided with the Constableship of the Duke of Wellington, who oversaw the reconstruction of the northern part of the Tower. The aftermath of the fire created an opportunity for recording the Tower as it was. 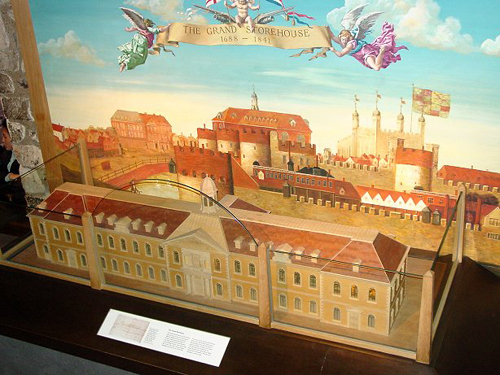 Fortunately a model made in 1842, now on display in the basement of the White Tower, shows how the Tower looked before the Victorian ‘re-medievalisation’ of the castle began. Plans made in 1841 also demonstrate how the northern Inner Ward had been dominated by the Grand Storehouse, and how the character of the medieval Tower of London had been gradually eroded over preceding centuries. 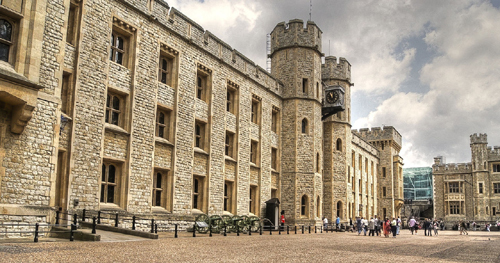 This major phase of construction at the Tower encompassed building the enormous Waterloo Barracks to accommodate over a 1000 men, and was named after the Duke’s most famous victory. This Royal Engineers-led building project initiated the nineteenth century obsession with restoring the Tower in conformance with the Victorian idea of a Romantic medieval castle. The Waterloo Barracks, the Officers Quarters (now the Royal Fusiliers Museum), the Constable Tower, and the majority of the northern curtain wall mural towers were re-built, or refaced, in a ‘neo-gothic’ castellated late medieval style, complete with gargoyles, rugged stonework, robust iron-strengthened doors, and large square headed Tudor style windows. The upper Bowyer Tower appears to have been completely rebuilt in this style by 1845, and was converted into a meat and bread store for the soldiers living in the Waterloo Barracks. Later still it became a museum store. For much of the twentieth century, the upper storey of the Brick Tower, the Bowyer, and the Flint Towers were used for storing the handgun collections of the Royal Armouries. 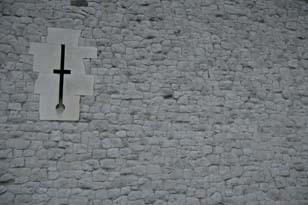 This continued a centuries-long tradition of keeping arms and ordnance in this part of the Tower. The collection in this part of the Tower has dwindled since most of the Royal Armouries collection was removed to Leeds in 1990. The upper Bowyer Tower and its neighbours were in the vanguard of neo-gothic building at the Tower. The building is a crucial element within an ensemble which owes its existence to the Duke of Wellington, one of the most important figures in British history in the nineteenth century. It is this northern, Victorian, aspect of the Tower which greets thousands of tourists as they emerge from Tower Hill Tube station every day. I was asked to carry out an analysis of the decorative schemes within the Upper Bowyer Tower. This has been largely taken from an excellent history of the Tower provided by Historic Royal Palaces. 1 George, Duke of Clarence was the third son of Richard, Duke of York, and the brother of King Edward IV. He played an important role in the dynastic struggle known as the Wars of the Roses, but is better remembered as the character in William Shakespeare’s play Richard III who was drowned in a vat of Malmsey wine.